It is getting close to Christmas and some of us will be racking our brains trying to think of something a little bit different to put under the Christmas tree this year. And what I am about to describe is definitely different and one to explore. Bliss Float has been open for about a year and in that time it has gained popularity. The rationale is a good one. In these days of overstimulation and stress, we need something which effectively switches us off, allows us to disconnect and relax and experience well being and harmony. 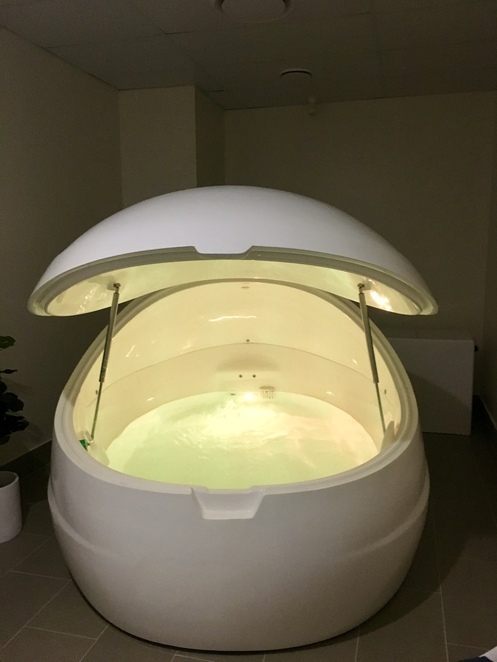 Enter the flotation pod - a special pod which is like a big cocoon, see photos below, set in a private suite, filled with Epsom salts and warmed to body temperature. So fancy a float? After a cleansing shower, I got into the pod with some trepidation and considerable curiosity. The pod closes over you and you have the option to turn off the lights. 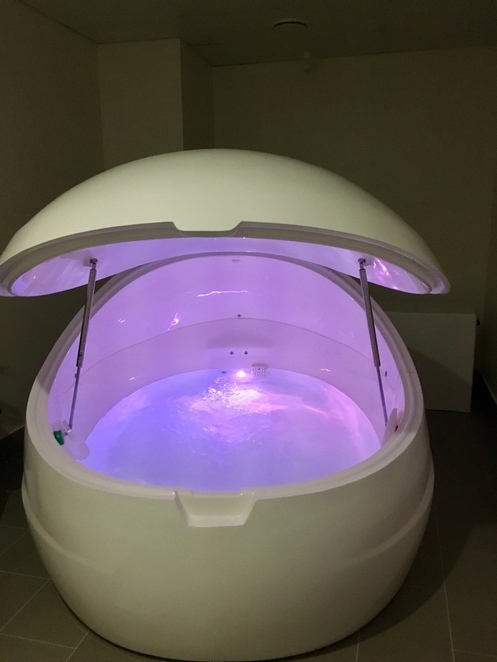 I was wondering what it was going to be like to experience complete sensory deprivation. 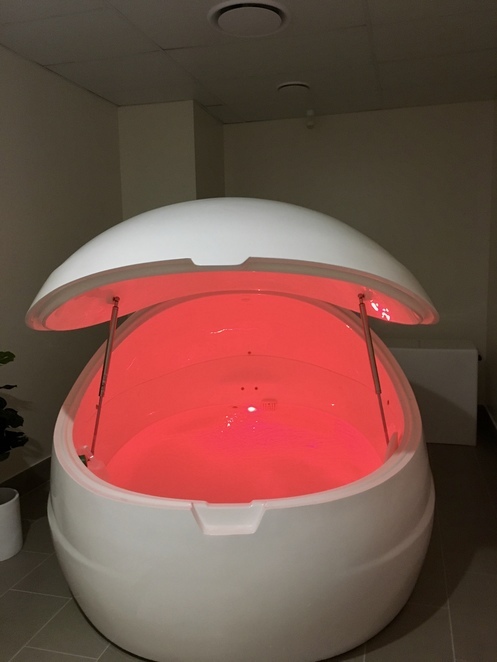 I questioned whether I would be comfortable being encapsulated in the pod. Both were completely manageable as the pod is equipped with a button which regulates lights. If you want the changing lights then you need do nothing further. If you want to turn them off, then a small turn of the switch will leave you in total darkness. Closing the pod over you is also very do-able in the sense that it can be lifted very easily and even has a handle that you can immediately access. I am not claustrophobic but there may be people out there who might think twice. So here I am in this warm and very floaty water - and also wondering how on earth a busy person like me was going to manage an hour floating. Actually mastering it takes a bit of practice and you have to find the position that enables you to relax completely. If you sit bolt upright, you don't get the reward of that weightlessness and you would struggle to stay that way. Equally, when lying back, you have to find a position where your head, which you place in a headrest, is totally relaxed. I found that the best way I could achieve this was to raise my arms behind my head and stretch my body out. And one hour I hear you say ... isn't that forever? And what do you think and do in that time? .... but to my very big surprise that hour passed very quickly and I was able to totally relax and enjoy the sensation. While my mind was not empty, I was mindful of the moment and I think that is the purpose of the exercise, so I fulfilled the objective fully without even trying very hard. It is a strange sensation, one which I suppose you would encounter in the dead sea which has equal quantities of salt in the water. The water feels different as does running your hand over your body. The sense of cocooning is also novel and one which to start with I thought would be odd but actually it delivers the right sense of well being and quietness. Oh and I forgot to mention that in addition to your lights you can also choose to have music playing or not throughout your session. So the hour passed very pleasantly and I knew it was time to get out when the water starts gurgling. That is your sign. Stepping out of the pod and having a shower was very welcome - but also quite necessary. The amount of salt in the water is considerable to enable you to float so it is quite important that you have a thorough shower and wash this out of your hair and body. And a word of advice - you need to wet your hair. I did not have a hairbrush which made hair washing a little challenging. They have hair dryers but suggest you take your brush along, if you want to look half decent and well rested as planned, instead of a salty crusty lunatic who has been dragged through a bush backwards. The post pod moments can be spent in their nice waiting area where you can enjoy a herbal tea and just pass some time recovering and/ or savouring the experience. The Spa offers infrared sauna treatments as well which I might have to try next time. Floating is said to offer benefits - relief from muscular pain, fatigue and anxiety. It certainly is a good way to gather your thoughts, pamper your body and switch off the phone for a whole hour. You will be surprised at how creativity springs forth from such a weightless time in the water. Some limited parking available on site. Why? This session makes you float on water. I have always wanted to try this.